The New York Islanders announced today that forward Mike Halmo has agreed to terms on an Entry Level Contract. Mike Halmo is ranked fifth overall in the OHL in scoring with 84 points. The Islanders signed him to an entry level contract on March 10. Halmo, 20, led the Owen Sound Attack and ranked fifth overall in Ontario Hockey League (OHL) scoring with 84 points (40 goals, 44 assists) this season. In his four-year OHL career with Owen Sound, the Waterloo, ON, native has 76 goals and 88 assists for 164 points. He served as captain during his fourth season. In 26 career OHL playoff games, Halmo has five goals and 11 assists for 16 points. 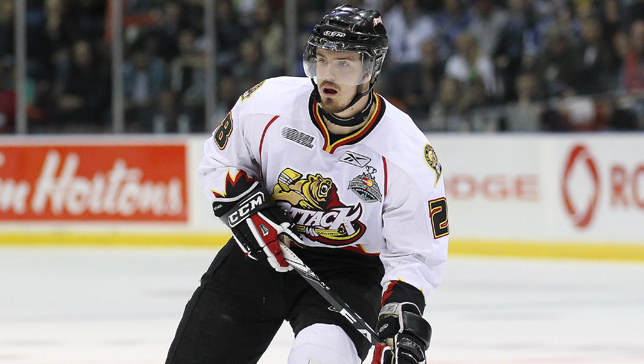 He helped lead the Attack to an OHL championship in 2011 with 15 points (5 goals, 10 assists) in 22 games.